What if I told you there was a way to double your storage space without buying an extra closet? Would you laugh in my face or wait to hear the rest of what I’ve got to say? It’s easy. 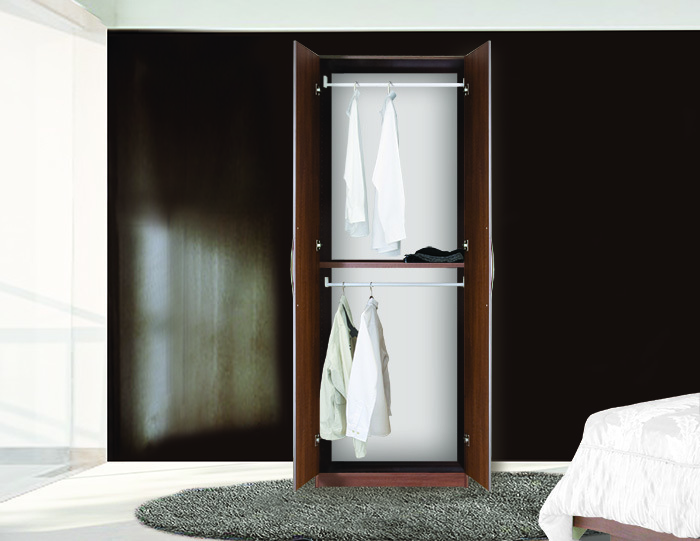 Several of our wardrobe closet interiors can be customized to accommodate double hanging, letting you hang twice as many clothing articles with no hassle. Be aware though that double hanging would most likely mean your wardrobe closet would not be able to house coats or gowns. Plan carefully before double hanging in your wardrobe space. Make sure the interior of your closet can accommodate double hanging and make sure that the clothing you intend to put inside of a double hanging space will all fit properly. There’s nothing worse than customizing the interior of a closet only to later find that you can’t actually utilize your custom options. This entry was posted in Closet, Organization, Storage, Wardrobe and tagged Closet, double, double hanging, Organization, space, storage, wardrobe. Bookmark the permalink.